By the mid 2000s, the F-22 was finally entering the fray as the world’s first true stealth fighter, offering a quantum leap in capability and performance when compared with anything else on the battlefield. It was a thoroughbred weapon system meant to shape the battlefield by vanquishing anything in the skies and neutering enemy air defenses, so that less capable combat aircraft could survive over the battle space. It was a high-end door kicker, the ultimate “anti-access” fighter. Gates’s push for the Raptor’s demise came at the same time as the cost of examples of the jet were rapidly dropping. For the last batch of 60 of the super-fighters, the unit cost per jet was $137 million, which is pretty close to the cost of an “affordable” F-35A today – at a time when a similar number of F-35s have been built as F-22s, about 165 compared to the F-22’s 187. Costs were slated to have continued to drop if another lot of about 53 jets were built to meet the Air Force’s stated minimum fleet size requirement of 243 airframes. But it never happened. Instead the F-22 was cast off and all of the USAF’s fighter chips were put into the very much unproven F-35 bucket. Gates justified chopping the F-22 as he wanted aircraft to “fight the wars we are in today, and the scenarios we are most likely to face in the years ahead.” Considering air superiority and destruction of enemy air defenses is an absolute must for any conflict (aside for ones with totally permissible airspace), this was a very near-sighted evaluation, and as it turns out, prediction of the future. To sustain U.S. air superiority, I am committed to building a fifth generation tactical fighter capability that can be produced in quantity at sustainable cost. Therefore I will recommend increasing the buy of the F-35 Joint Strike Fighter. A misleading statement if there ever was one, as it’s impossible to build something in quantity at a sustainable cost when you’re not willing to build it in great enough numbers so that a sustainable cost is achievable. It’s a bit of a chicken-and-egg scenario, but at some point, the costs eventually balance out. For the F-22, that point was rapidly approaching. We have fulfilled the program. It’s not like we’re killing the F-22. We will have 187 of them... The military advice that I got was that there is no military requirement for numbers of F-22 beyond 187. Considering that the minimum the Air Force said they could operate with was 243, this statement seems less than true. 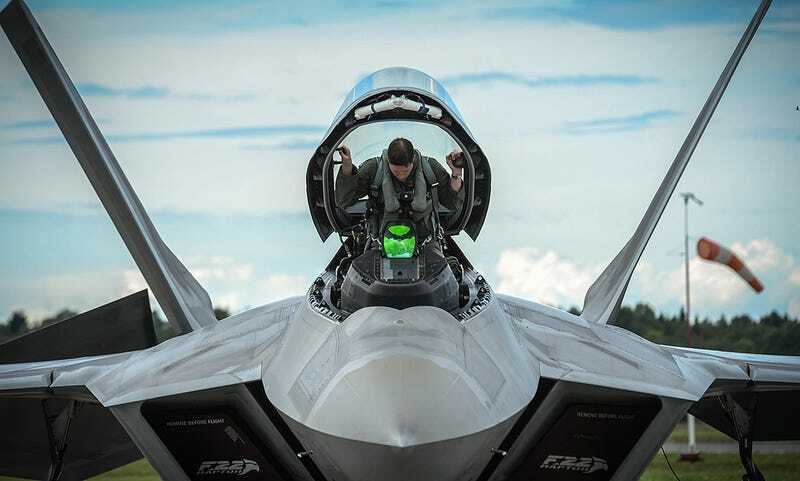 And that number was last ditch compromise, the real bottom-line fleet size the USAF required of the F-22 was around 339 jets, which itself was dropped drastically from the original number of around 750 jets originally envisioned. At 339 examples it was hoped that the F-15C/D force could have been retired. Yet Gates was not alone in the push to cancel the F-22. The Bush administration was guilty of it too, although they were able to punt the final decision to the Obama administration, who demanded it be cancelled with a sharp veto threat. Key Congressional figures like Senator John McCain also wanted the Raptor line shutdown. Their justifications ranged from the program’s expense, which was largely sunk costs for research and development over the aircraft’s 30-year gestation period, to statements proclaiming that China would not unveil a stealth fighter until late in the next decade, with no chance of it being operational until the mid to late 2020s. Today, China has two stealth fighters flying, the first one, the J-20, getting airborne well before the last F-22 even left the production floor. The timing of the J-20’s first flight also occurred while Secretary Gates was in Beijing meeting with top-level government officials. The event was a well planned propaganda affair that aimed to make Gates look bad for underestimating Chinese technological capabilities. For F-22 supporters it was an unwanted vindication. Another common argument against the F-22 was that the idea of America meeting Russian, or any near-peer state fighter aircraft, head-on in battle was a relic of the Cold War, and had no place in 21st century. Because of this, less potent, multi-role platforms were more of a necessity. Fast forward a half decade, and that statement is far from accurate. In fact, the F-22 just made its first deployment to Europe as part of a security package to deter Russian aggression and to reassure our NATO allies. The F-22 has also been regarded as a force multiplier in the air war against ISIS, itself attacking many targets with great precision from the first night of air strikes in Syria on. He also said that follow-on batches of F-22s were quoted as costing well below $90 million per copy fly-away cost, which is about 25 percent less than the cost of an F-35A today. Because only 187 F-22s were built, with only about 125 of the jets setup for assignment to combat units at any given time, even fullfilling small detachments of F-22s to the Pacific, Middle East and European theater may be troublesome. As such, the F-15C/D force, which less than a decade ago was suffering from mid-air breakups resulting in a year-long grounding, has had to stay online to supplement the relatively tiny F-22 force. At the time of the F-15C/D fleet’s grounding, the talk was that the Eagles needed either deep and costly refurbishment or replacement. Now these jets are slated to serve for decades to come in an attempt to fill the gap left by a curtailed F-22 production run. In order to do so, the “Golden Eagle” fleet of around 200 aircraft will require billions worth of upgrades, including both structural and major capability enhancements. With all this in mind, if we built enough F-22s to eradicate the enemy’s defenses, both in the air and on the ground, and improved the aircraft over time, perhaps even stretching it into an FB-22 with F-35 like avionics, would the USAF need an F-35A at all? Instead, the force could be filled in by other high-end capabilities currently in the works, like a new long-range stealth bomber, stealthy standoff weapons and unmanned combat air vehicles. On the low-end side of the equation, plentiful, relatively cheap and proven platforms, like the F-16 and A-10, among others, could be available once air dominance has been achieved, or for lower-end conflicts that do not require the F-22’s high-end anti-access capabilities. What makes things worse is that the floundering F-35 program has sucked funds for much needed upgrades on existing systems, including the F-22. In fact the F-22 lacks relatively standard technologies found on all of America’s fighter fleet, thus needlessly handicapping America’s “tip of the spear” fighter. So what exactly happened here? If we clearly do not have enough F-22s today and it seemed nobody really thought we had enough at the time of its cancellation, aside from those with the power to kill the program, and the jet was passed over for the F-35, an aircraft that the USAF itself admits cannot fill the high-end role like the F-22, somewhere along the line disinformation was passed along to decision makers, or worse. So why don’t we pull those key decision makers in and have them explain exactly how they understood the situation at the time, what information and intelligence were they going off of, and who gave them that information and when? The F-35 is said to be the biggest weapons program of all time, literally a $1.5 trillion income proposition over its lifetime. As such, it has a tremendous amount of special interest, Congressional and corporate “momentum” behind it. During the period of the F-22’s cancellation, the F-35’s problems were just becoming so serious that they could no longer be denied. Any competition threatened its existence, including the F-22, Lockheed’s own product. For the USAF, why dive into a pit of unknowns and cost and timeline overruns when you already had the best fighter in the world in production? Yet given what we know now now publicly, the limitations of the F-35, especially in the air-to-air realm, could have made the decision to end the F-22 production much tougher. Especially as claims about the jet’s maneuverability were far more exaggerated compared to reality. Which is something even the Air Force has admitted to now. Since there appears to be little will in Washington to correct the error in judgement that ended the F-22 line by putting an improved F-22 back into production, we need to learn from this very expensive mistake. This is especially relevant considering nearly $30 billion of the F-22’s nearly $70 billion program cost was spent to just develop the fighter. By better understanding what they knew and when they knew it, and above all else, where the information for their conclusions came from, we can at least try to avoid such procurement and strategy blunders in the future.